Case Study: Grateful to be Alive! By the time 59-year-old “Maddie” arrived at TMS Center of Colorado, she had tried just about everything to treat her depression and anxiety, including counseling, electroconvulsive therapy (ECT) and medication. It seemed there was no hope. She had been in therapy for 15 years and hospitalized three times for mental health reasons. She was also prescribed numerous powerful drugs and had six sessions of ECT. Referred to TMS Center of Colorado by her psychiatrist, Maddie was feeling sad and depressed all the time, and she also had strong suicidal thoughts. She was crying frequently and also suffering from anxiety. Medications that she had tried – without success – to treat her mental health issues included: Mirtazapine, Lamotrigine, Topiramate, Abilify, Thyroxone and Acamprosate. When Maddie came in for her psychiatric evaluation at the center, her test scores showed she had significant depression and her anxiety was in the moderate category. Based on her test results and evaluation, TMS Center of Colorado recommended and carried out a course of Brainsway® deep transcranial magnetic stimulation (dTMS) therapy over a period of eight weeks. 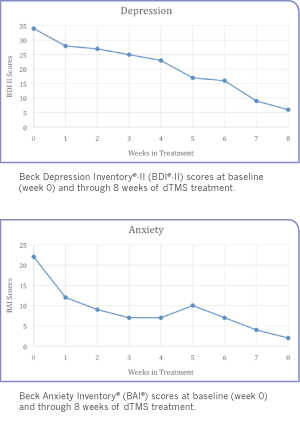 After her initial 38 dTMS sessions, Maddie’s depression score decreased to 6 and her anxiety score decreased to 2. The low scores reflect the “normal ups and downs” of daily life and indicate a remission of both depression and anxiety. Maddie continues to come in for maintenance sessions once every two weeks and has been in the maintenance phase of treatment for about 2 years. The ongoing treatments have allowed Maddie to maintain the positive effects of TMS, and her scores continue to stay just above remission levels.